You won’t get nature’s raw beauty, cool climate wines made by passionate winemakers, fresh, locally grown produce and award winning food curated by talented chefs any closer to your doorstep than the Hills. So why not stay for a short getaway? We’ve put our top accommodation picks together covering luxury, family friendly, nature based and down-right quirky. Head to Longview Vineyard in Macclesfield for a range of 4-Star accommodation surrounded by one of the Adelaide Hills’ most awarded vineyards. Choose from indulgent suites, spa suites or the homestead and breathe the freshest air, marvel at millions of stars and drink in the spectacular views. Over in Woodside, Barristers Block Vigneron Villa is a fully renovated house adjacent to the Barristers Block Cellar Door and Vineyard. Soak up the peaceful surrounds of the vineyards, landscaped gardens and farm life while sipping on their premium wines. Imagine an idyllic country escape to the Cobb’s Hill Estate, an original homestead dating back to 1854 located roughly halfway between Oakbank and Lenswood. Set in a botanic garden surrounded by walking trails, panoramic views, 50 acres of vines and farmland, you’ll certainly enjoy your own country estate for a while. Situated in the picturesque Piccadilly Valley next door to the Mount Lofty Botanic Garden, you’ll find Esto House. Perched above the rolling vines of The Deanery Vineyard, Esto House has been skilfully renovated into a luxury 2-bedroom house that embraces a stylish, contemporary design whilst retaining its Adelaide Hills charm. Experience royal luxury in your very own castle at the award winning Thorngrove Manor nestled in Stirling. Escape to your own private residence with dramatic glass walled features, ornate furniture and views across tranquil ponds and terraced box hedged gardens. Regal rooms and residences including the Kings and Queens Chambers display unique, creative and inspired architecture, captivating style and contemporary influence. A true fusion of architecture, boutique accommodation and the decorative arts in an experience you’ll never forget! For a tranquil, secluded escape head to the architecturally designed Cladich Pavillions in Algate in the Adelaide Hills. Three luxurious, contemporary self-contained suites are nestled in nature amongst towering Stringybark eucalypts and abundant birdlife offering a truly indulgent and private accommodation experience. An Adelaide Hills icon established in 1852, you can’t go wrong with Mount Lofty House for an idyllic Adelaide Hills getaway. Overlooking the picturesque Piccadilly Valley in Crafers, take advantage of a variety of accommodation options including suites in the original house and four cottages on the property. Soak up the magnificent views while you dine at the award winning Hardy’s Verandah Restaurant, or relax in the tranquil surrounds of the Stables Day Spa, both located on the property. Set on expansive, tranquil grounds in Balhannah, two completely refurbished retreats promise a new level of luxury. Choose from Villa Lemoni with two-bedrooms or the Nest for the ultimate couples getaway. Add an indulgence package to your stay full of Adelaide Hills treats and take in everything this stunning location has to offer. 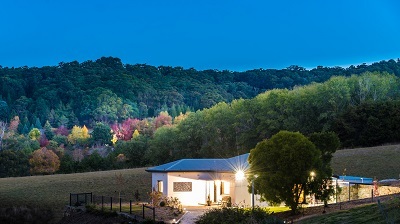 Detox, disconnect, head off the grid with CABN – an eco-friendly tiny house set in in 180 acres of natural scrubland in the Adelaide Hills. Complete with king bed and all the essentials you’ll need (which let’s be honest isn’t much when we think about it! ), CABN is a truly off the grid experience that puts you in the heart of nature. Revel in the mystery of the night sky, take in the abundant wildlife around you and most importantly, disconnect from the world for a while. For a really quirky eco stay, try Earthship Ironbank in Stirling where you’ll get to experience the future of sustainable living in this unique bed and breakfast with a tiny eco-footprint! If you like your itinerary a little more food-centric, then the Sticky Rice Cooking School and Villas in Stirling - a must see and stay. Make a weekend of it, exploring all the region has to offer before donning your apron and enjoying a guided cooking class before retiring to one of three villas on site inspired by Bali, Thailand and Japan. Packages are suitable for couples, small groups, or something different for your wedding party! Sometimes there’s nothing nicer than staying in a refurbished pub steeped in history! Both the Crafers Hotel and Stirling Hotel have undergone significant refurbishment, with a selection of elegant expertly, furnished rooms that pay homage to their heritage. Just 14km from Stirling one of the Adelaide Hills’ most iconic historic properties, Camelot Castle is undergoing a dramatic transformation. Located on Lobethal Road in Basket Range it’s almost ready for the big reveal as the newly renamed The Manor Basket Range in March. With an accommodation offering including 12 suites, an impressive destination wedding/function space it’s worth keeping on the ‘must stay list’. If you’re thinking a golf weekend is on the cards, then look no further than the Stirling Golf Club. Spend a day on the green then head out to sample the exceptional food and wine offering on your doorstep in the Adelaide Hills! Take advantage of a range of packages or talk to the Stirling Golf Club about tailoring something to your group. For centrally located family friendly accommodation look no further than the Hahndorf Accommodation Group’s three properties - The Manna of Hahndorf, The Haus Studio Apartments and The Hahndorf Motor Lodge. With more than 85 rooms across all three properties including self-catered apartments, motel style rooms and boutique luxury suites, you’ll find something for every budget. If you’re looking to break your stay into bite sized chunks of exploring and on-site entertainment and activities for the kids, then the award winning Hahndorf Resort is the perfect in between. Offering resort style accommodation, caravan and camping facilities, a bistro and a range of kid-friendly activities, they’ve got everything you need for a relaxing weekend away! Alternatively, the Mount Barker Caravan Park 10 minutes from Hahndorf has a selection of powered sites suitable for large vehicles as well as self-contained cabins. With extra-large rooms and all amenities for self-catering, the recently completed Birdwood Motel is great for those looking for a little extra space in a convenient Adelaide Hills location. 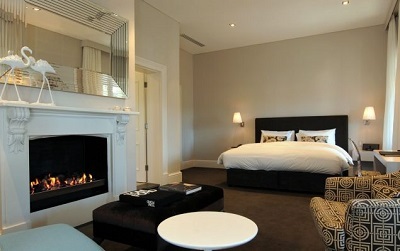 Located in iconic Birdwood, the apartment style rooms overlook the National Motor Museum grounds - home to one of Australia’s largest motoring collections. Get a small group together and head to the hills for a weekend stay at Jura House, a boutique homestead overlooking the Onkaparinga Valley and Mount Lofty Ranges. This modern five-bedroom homestead is nestled on 61 acres in the Adelaide Hills offering the ultimate in group getaway luxury! Suitable for families and large groups looking to stay together in separate rooms on the same property, Longwood Retreat is a hidden gem in Mylor. Rooms overlook a valley of native plants, trees and vineyards with abundant bird and wildlife and clean country air to refresh the soul. For bigger groups, the Woodhouse Activity Centre (see below) is also a great option. Nestled in the Piccadilly Valley, you'll find six different styles of accommodation on the 54-hectare property at the Woodhouse Activity Centre, aptly arranged by brick, timber and canvas categories depending on the type of adventure you’re after! With obstacle and orienteering courses, activities galore, BBQ facilities and of course the surrounds of the bush and nature, it’s the perfect adventure getaway for families or groups who love the outdoors. If camping under the stars in a forest is more your thing, consider a getaway to the Adelaide Hills region including forests in Mount Crawford and Kuitpo. Enjoy horse and bike riding trails, camping and hut accommodation from May to October each year (outside of fire danger season). Browse and book your accommodation online or visit the Adelaide Hills Visitor Information Centre in the main street of Hahndorf for more information or ideas on where to stay.